While there are some big, obvious signs that you need to see your dentist, like a missing or cracked tooth, there are plenty of signs that often fly under the radar or simply go ignored. However, the longer you ignore a problem, the worse it can get. For that reason, we’re going to look at signs you need to visit your dentist in Guildford. In many cases, patients will ignore an aching tooth or gum for quite some time. It’s true that sometimes they can be minor problems that go away without incident. However, if the ache is constant over a period of several days, it’s a good sign that something is wrong, and you need some help. For instance, your tooth enamel might have weakened due to gum recession or sugary foods and drinks, making them highly sensitive. Tooth decay is another highly common issue, caused when plaque bacteria starts producing substances that penetrate and break down the inner-tooth material. A less common cause, but one that still merits a visit to the dentist, is bruxism. This is when you grind your teeth, especially at night, which can lead to pain, crooked teeth, and jaw misalignment on top of stress and poor sleep quality. It might seem like more of an annoyance than a serious problem, but the truth is that a dry mouth can be very detrimental to your oral health. That dryness helps bacteria spread, which can lead to an increased risk of gum disease, tooth decay, and infection. However, your dentist can help you find and treat the cause to get restore some balance back to your oral health. If you have noticed that your gums have been looking a little redder and a little angrier in the mirror, or that they have been bleeding when you have been brushing lately, it’s recommended you visit your dentist in Guildford as soon as possible. This is one of the most common signs of gingivitis, also known as gum disease. However, it may also be a symptom of periodontitis, a condition that can eventually lead to tooth loss. We all experience bad breath from time to time. Most people don’t wake up with a fresh mouth in the morning and eating certain foods or drinks such as coffee can affect that, too. However, if you’re going through most of your day with bad breath, it’s a sign that something else is wrong. It may simply be that your oral hygiene practices aren’t up to scratch, and your dentist can help you improve them. However, it may also be related to gum disease and xerostomia (or dry mouth). Those who experience jaw pain may believe it has nothing to do with their oral health at all. However, there are several problems that begin in the mouth that can be causing that jaw pain. This includes bruxism (teeth grinding at night) and cavities which can extend to the root of the tooth. Left untreated, these cavities can cause abscesses to grow, which can be potentially very dangerous. It might not look like anything too alarming at first if you see spots that are particularly bright and white on teeth that are otherwise a little duller. However, this is, in fact, one of the first signs that you might be suffering from dental decay. As bacteria proliferates, acid is produced, which begins to wear away at the enamel, causing the white under the surface to show. For many individuals, tooth decay may be happening even when there is no pain or other unpleasant symptoms. For that reason, regular check-ups with your dentist are an important part of safeguarding your oral health and reacting to potential dangers as quickly as possible. Though there might not be any cause for concern, if you have had work done on your teeth, then it’s wise to visit the dentist once in a while just to make sure that everything is working as it should. This includes those who have fillings, dentures, crowns, and dental implants. Although they are built to last, it’s only natural that they need some adjustment over time as everything is subject to a little wear and tear and changes in the mouth can have knock-on effects on that work. There are several medical conditions that can affect or be affected by your oral health. For instance, those with diabetes and high blood glucose levels are more likely to be at risk of gum disease. In the case of those with cardiovascular disease, it’s been well established that healthy, clean teeth and gums can reduce the risk of cardiovascular episodes. Other health issues like eating disorders, hormone replacement therapy, and chemotherapy or radiation treatment for cancer can have implications for your oral health, so it’s important that you and your dentist have a course of action to counteract them. Lastly, the single best reason to make an appointment with your dentist is to begin and carry on with a route of preventative treatment that ensures your teeth are kept in the best possible health. Many of the earliest signs of issues like gum disease and tooth decay aren’t easily felt, but they can be spotted by a dentist. 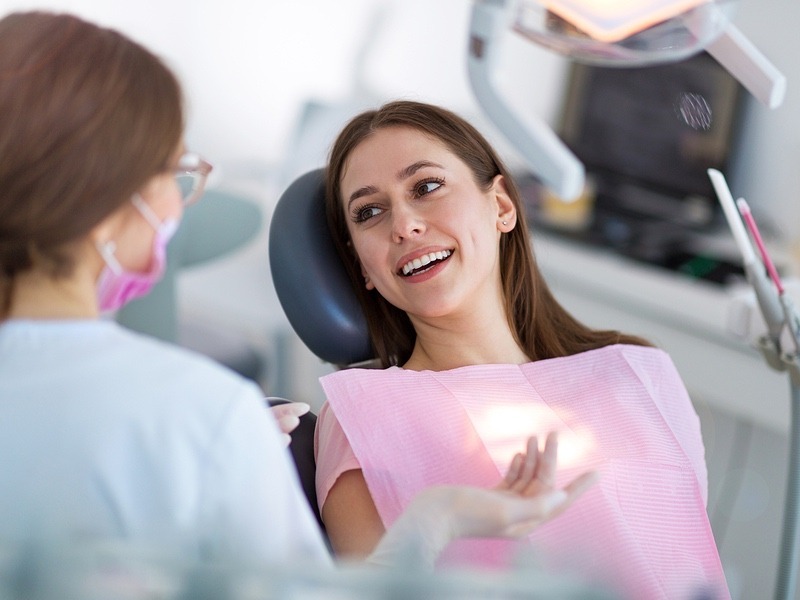 With a focus on preventative care, oral hygiene tips, and a vigilant eye for early signs of issues, you can avoid many of the symptoms mentioned above for longer or simply make sure that any issues are handled as quickly and effectively as possible. If any of the signs above sound familiar, then it might be time to make an appointment with Woodbridge Dental in Guildford. With professional attention to detail and an excellent level of personal care, we can help you get your oral health back up to scratch.